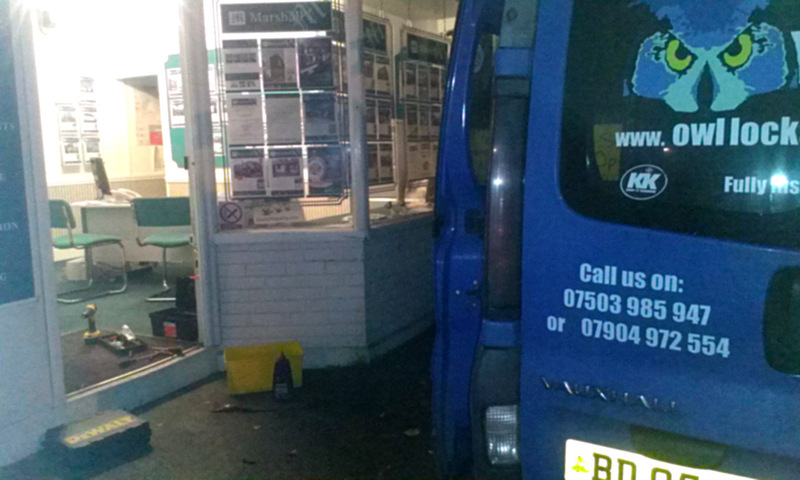 Our client’s Marshall’s Estate Agents in West Cornwall required a lock replacement in one of their 6 offices. Because the lock was in the main front office door and is in constant use during office hours it was decided to undertake the work in the late evening so as not to disturb the customers and staff. In theory, this should have been a normal and straight forward lock replacement, but on getting the old mortice deadlock out of the door we discovered that it was not only old but also not up to current insurance requirements. We therefore had to upgrade the lock and in its place fitted a 5 Lever Mortice Deadlock that conformed not only to insurance requirements but also current British Standards. As the replacement lock was slightly bigger, this meant enlarging the hole in the door and changing the keep in the frame. We also strengthened the door slightly as being old it was showing signs of wear and tear and part of the door not to far from the lock itself had a nasty split which if left would have only gotten worse. We drilled into the door slightly, placed screws in the holes to secure the split wood and then filled over the top so that once repainted the fixings would never show. Although the job took longer than initially planned, we were there just over the hour and the result was complete success. Don’t forget; check your insurance policy and your locks on both doors and windows to see if you are fully covered. It only takes minutes to check, but could save hours, weeks or months of frustrating problems in the future. If you require our services, but you’re not available during normal working hours we will make arrangements to attend out of these times.